Included are 3 wall sconces, which are convertible to medium swag shades for matching lamp sets. You will also find 2 of the popular inverted ceiling style shades. Most shades are medium sized, suitable for either swag or lampbase applications. 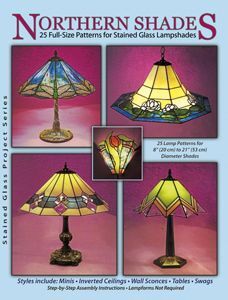 Includes: 25 full-size lampshade designs range from small night-stand styles, to elaborate dining room show pieces. Color photographs and instructions.